Three heart sculptures that are part of a community art project benefiting Ronald McDonald House Charities of the Inland Northwest have been found vandalized in the past week. 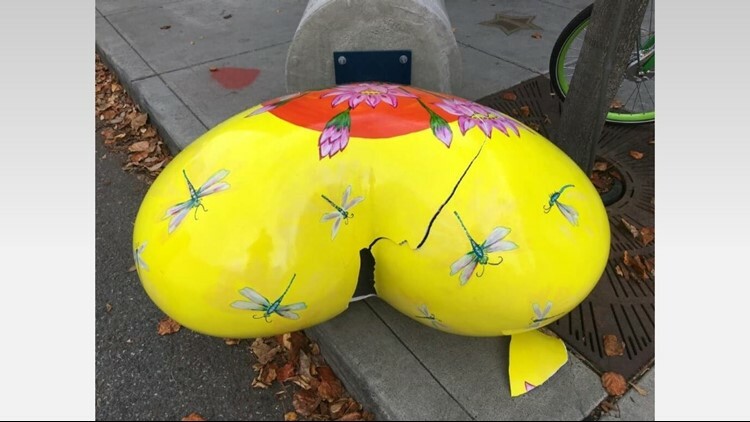 Spokane police have arrested a suspect who is accused of breaking a fiberglass heart sculpture that was made to raise money for Ronald McDonald House. On Wednesday afternoon, Spokane police responded to a report of a man who broke one of the hearts with a large stick on West Main Avenue. Witnesses provided officers with photos of the suspect. Officials said officers later located the man, Vonnelliott Mitchell, 28, who had changed his clothes but was still carrying the stick. Authorities said Mitchell did not cooperate with the responding officers. He has been arrested for second degree malicious mischief, possession of a controlled substance, obstructing officers, resisting arrest and outstanding warrants. Police officials said the investigation is still ongoing to determine who is responsible for the previous vandalism to three other hearts. The 25 sculptures were created for the Give Love Heart Project, a partnership between the Ronald McDonald House and Spokane Teachers Credit Union (STCU). Julie Delaney, marketing and communications director with Ronald McDonald House Charities of the Inland Northwest, said the hearts were pushed over at their 900-pound concrete bases. “It is a very deliberate form of vandalism. You have to really want to push these over intentionally. They are not going to just get bumped and fall,” Delaney said.“We are saddened by this senseless vandalism that impacts our community’s ability to do such an exciting project that supports the families with critically ill or injured children staying at the Ronald McDonald House,” Ronald McDonald House Charities of the Inland Northwest Executive Director Mike Forness said in a statement. 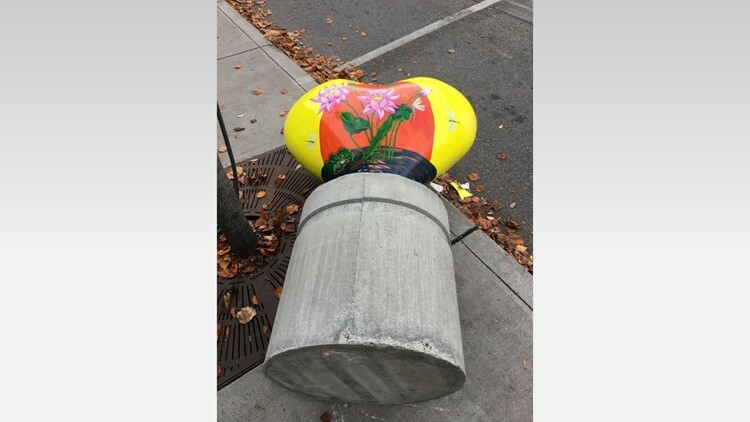 "We are calling on the community to be vigilant in watching over these works that so many local artists donated their time creating.”Delaney said Ronald McDonald House discovered a heart vandalized in front of the Chase Bank building in downtown Spokane last week. They discovered two vandalized hearts in front of Cutter Tower and the Fox Theater on Tuesday. The heart in front of Chase Bank suffered minor damage, while the others suffered significant damage, Delaney said. It is possible that the first piece can be repaired and Ronald McDonald House will work with the artists to see if the hearts found on Tuesday can be repaired. Delaney said the hearts shattered like glass bowls since they are made out of fiberglass. The hearts will be on display until the end of February and sold at a gala on Mar. 1. All proceeds benefit the Ronald McDonald House. Businesses throughout Spokane also pay to sponsor certain sculptures with proceeds benefiting the Ronald McDonald House. Ronald McDonald House is in the process of working with the Spokane Police Department in response to the vandalism, Delaney said.